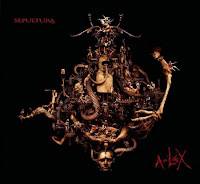 All of you Sepultura fans might already know enough about 'A-Lex, so I'm not gonna write much here. It should have already been released in November, but somehow it got deferred to January, couldn't understand why the label made this decision, though there was already a p2p version out. Some of you might enjoy this, even if he Cavalera brothers are missing and as it's highly anticipated, I put 'A-Lex' under the 'Must-Have' category.